Rick Majerus coached 25 seasons in college basketball. The NCAA lost a coaching legend today. Rick Majerus passed away of heart failure at 64 years old. 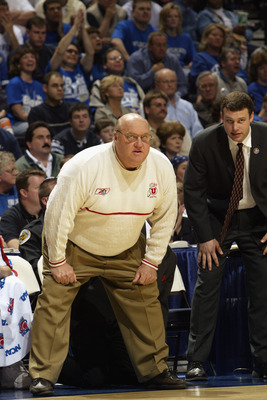 Majerus was a head coach for 25 seasons at Marquette, Ball State, Utah and most recently St Louis. He won 517 games and made the NCAA Tournament 12 times. Of those 12 NCAA appearances, he made 2 Sweet Sixteens, 1 Elite Eight and lost to Kentucky in the 1998 National Championship. Majerus began his coaching career in 1983 at Marquette. He led Utah to the 1998 National Championship against Kentucky. Majerus finished his coaching career with St Louis. This entry was posted in NCAA Basketball and tagged Ball State, Marquette, NCAA tournament, Rick Majerus, St Louis, Utah. Bookmark the permalink.